), and eating one of those foods at a time in large amounts. If you're eating in this simple manner, you're eating a mono meal. Mono meals are a centerpiece of a healthy raw food diet, but everyone desiring optimal digestion should eat this way. Want some example videos showing off ideal mono meals? Coming home after a long run and tucking into the best mangoes on earth. Devouring half of a large watermelon. Most meals in the western world revolve around a slab of meat and a starch, such as bread or another grain product. The standard example is steak and potatoes, which is so iconic that some people will describe themselves or another as a, "steak and potatoes," kind of person. Unfortunately, this combination of a protein-rich food and a starchy food is just asking for trouble. Starchy foods require an alkaline digestive medium. Protein-rich foods require an acid medium. When acids and bases (alkalines) meet in any situation, they neutralize each other. This also happens in the stomach. 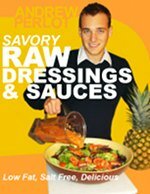 Sinfully delicious, digestion-safe raw dressings can spice up your salad every night of the week. With no acids breaking down our food, they quickly start to ferment and rot in the humid, dark interiors of our bodies. These combinations are not working for most people, and they cause such distress that the antacid industry in the United States brings in a staggering $8 billion a year. Monomeals help to bring a degree of digestive sanity back to your eating, limiting you to a few large meals of healthy food each day. When there's just one food in the stomach, the digestive mediums produced by our bodies quickly break down food without the byproducts of gas, acid reflux, and other issues. But surely, you reason, there's a difference between a meal of steak and potatoes and bananas and blueberries, right? Sure. The fruit is usually going to digest better than the water-poor and high-protein foods found in cooked diets. 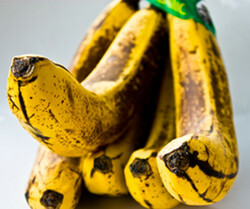 But as an experiment some day, try eating a meal of just bananas for breakfast. At lunch, combine bananas and oranges: my guess is you'll notice that those bananas and oranges cause a noticeable decline in digestive ease. The exception to this would be if you ate hard-to-digest foods at dinner the night before and those had not yet left your stomach by breakfast time. In this case, your digestion at breakfast will be bad too. One thing I don't suggest is the eating of mono diets for long periods of time. While harmless for a week or a month, and even beneficial, when we eat only one food for months on end we're bound to start running into deficiencies. No one food can meet all nutritional needs, and variety is a key to long-term health. I'm certainly not telling anyone to never mix foods, but merely pointing out an ideal to shoot for. Personally, I usually eat large meals of one type of fruit at breakfast and lunch, and then make a well-combined salad for dinner. On occasion I also eat well-combined meals of fruit, but this is the exception rather than the rule. So how do you know what's a good combination and what won't work well together? Check out this guide to food combining to learn more about mixing fruits and vegetables. Of course, individual digestive strength will also play a role in digestive ease. So let's say you want to make a salad of lettuce and tomatoes. What type of dressings should you put on top? Here are eight of my favorite dressings, all of of which are well combined. 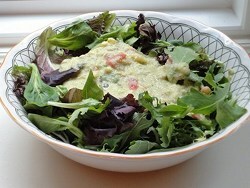 Learn how to eat mono meals as part of a healthy raw food diet. Get some tasty, well-combined raw food recipes. Figure out how to lose weight on a raw food diet.